Since writing an earlier blog entry about photographing US history locations, the subject of European history and some of my older photos entered my mind. Again, history combined with photography is my personal perfect storm. European history is so much more far reaching than that of the US simply because their cities existed when the United States was nothing more than trails and villages from the Pacific to the Atlantic. To put it in to perspective, numerous European cities are well over a thousand years old, literally these are everywhere. However, if something is a hundred years old in the USA, we hang a plaque on it… I mean, comparatively speaking, the ink was still wet on our Declaration of Independence when European history was almost completely written. Admittedly, I’m nowhere near as handy with European history as I am with good ole’ US history. This blog page will be more about photos I took in some pretty cool places. 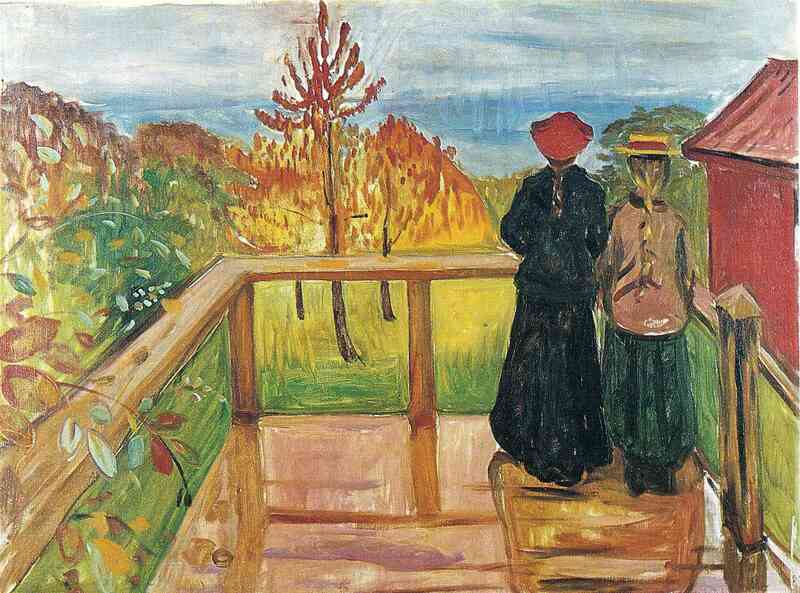 For example, the below photo was taken at the location for the portrait at top of this page entitled Rain by Norwegian artist Edvard Munch. This photo was taken at Edvard Munch’s house in Åsgårdstrand, Norway. Munch’s most famous painting, called The Scream, sold for almost 120 million dollars in 2012! Many artists, especially Impressionists painters, went to Norway for the long sunrises and sunsets that allowed for them to paint much longer than the sun would allow in other parts of Europe. Åsgårdstrand is truly a beautiful place worth seeing. While living in Italy it was impossible to not notice the history that surrounded me practically everywhere. There is so much that it is very easy to not notice it sometimes, one can actually become immune to it. It’s like when you meet someone from Washington DC who has never visited the White House or gone to the Smithsonian… There would be something like this villa on a lake at left, you’d make a note and look it up when you got home and then understood what it is. This little villa sits on Lago Fusaro near Naples, Italy and is called Casina Vanvitelliana; it was the royal hunting lodge for the Bourbon Kings of Naples and even had famous musical guests like Mozart and Rossini. This photo is called The Villa (at left). Also near Naples is a great find for Greek history buffs, it’s the ruins of a Greek city called Paestum that date back to about 500 BC! If you’d like more, I wrote a separate blog post back in February 2014 called The Temples of Paestum. One thing to consider in some parts of Europe when shooting photos, many locations aren’t fond of tripods. I was chewed out here in Paestum for using a monopod. Most churches and archeological site forbid tripods and I’ve heard various reasons. The temple below is believed to honor Poseidon. Naples is very unique as it’s not uncommon to see recent history from World War Two standing next to history that is thousands of years old. Below is a photo of the Abbey at Monte Cassino which has stood here for centuries. The original building was sacked and destroyed many times in its history and to put European history in to perspective, the first time it was sacked was 700 years before Columbus sailed for the New World and 1700 years before the days of the US Declaration of Independence! The last time it was sacked was during Allied bombings in 1944. The abbey, like Europe, has stood the test of time and will leave you with your mouth open should you ever have the chance to visit. Living in Italy was an incredible experience, I would go back in a minute too. I would return not just for the incredible history, but the people and the way of life as well. Prev Post: My Pic @ The Daily Beast! Next Post: My pic made the list!